DPS carried out the architectural and engineering design for a lab fit-out project for inviCRO in Boston, Massachusetts. DPS carried out the architectural and engineering design for a lab fit-out project for inviCRO in Boston, Massachusetts. 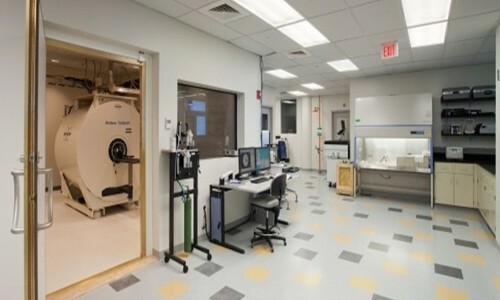 Site features included an animal care facility (vivarium), a full functioning MRI, CTs, hot cells, a radio chemistry lab and autoradiography suite, a full open optics lab, and office space all located in a 6,000 SF area within a 200,000 SF building. DPS prepared the programming phase and schematic design through to full detail design and construction administration. DPS scope included architectural design, lab planning, and MEP services design. This lab fit-out was considered a streamlined project. In all three parts of the project—interior office, laboratories, and animal care facility—DPS provided a low cost, signature, yet practical solution. The architectural scope included a new autoradiography suite, radio chemistry lab., optics lab., vivarium and office areas. The design and project execution was successfully completed with an existing facility no impact to adjacent tenants.